View of Dois Irmãos from Ipanema. There are favelas hidden in the mist on both sides of Dois Irmãos. 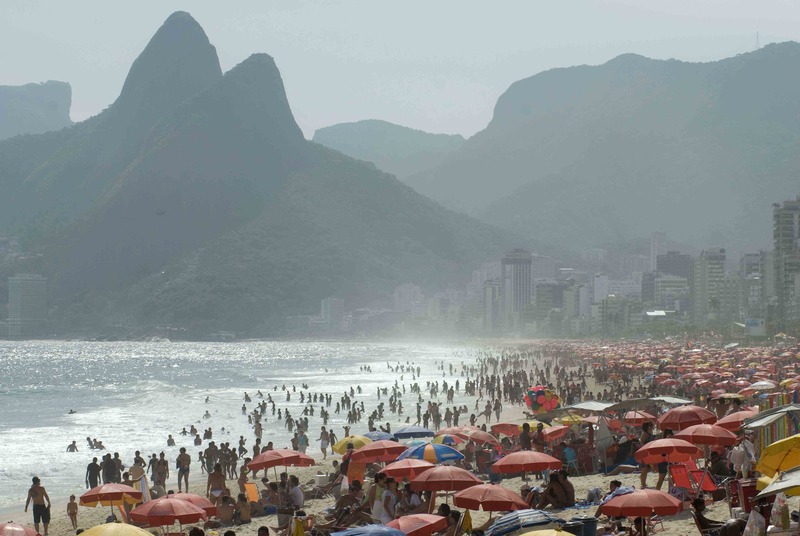 Rio de Janeiro is arguably the most civilized city in the world in which to live… or one of the worst. If you are one of the privileged who can afford an apartment in Ipanema or Leblon this is paradise on earth. If, however, you are not numbered among God’s chosen life can be a very different ball-game. There are few places where the disparity between rich and poor is so immediately visible. At night the gigantic rock cones of Dois Irmãos glitters like a Christmas tree with its jumble of flickering fairy lights. From this distance the favelas seem peaceful, even beautiful, occupying as they do a perfect vantage point over the bay that is one of the natural wonders of the world. Only the helicopters hovering overhead betray the fact that there is an invasion going on. Many of Rio’s slums are complete no-go areas, effectively demilitarized zones where Brazil’s police force are unable to set foot. One of the reasons the city has such a deplorably high crime rate is because thieves are aware that if they can only make it to the sanctuary of the favelas there will be little chance of arrest. These quarters are controlled by local drug lords and patrolled by their armed foot-soldiers – often gun-crazed adolescents with the glazed eyes and unpredictable expressions of crack junkies. Normal day-to-day life only functions at all because the various warlords maintain an uneasy truce that allows business to run with only the occasional firefight or execution to interrupt proceedings. With the 2014 World Cup and the 2016 Olympics looming, the federal government is now making a concerted effort to “pacify” the last of these lawless areas. The cavalry has been sent in full skirmishing order into the heart of “apache country”. The drug armies are well armed, however, with automatic rifles and even grenade launchers. A couple of years ago they succeeded in shooting down a helicopter – and nobody is really sure just how much of a battle lies ahead. Life in the favelas has always been brutal. And all too often, it is also short.